We wrote an article on customizing Blog Post Footer elements, adding pictures, signature, changing the wordings of the elements, etc. If you are not thinking of adding images, but simply changing the text or the position of these Blog Post elements, there is an easy way to do it. You can set a number of posts to be shown or number of days with post. If your posts are lengthy, try not to set the number too high because it affects the load time of your page. You may even uncheck it so as not to display dates. 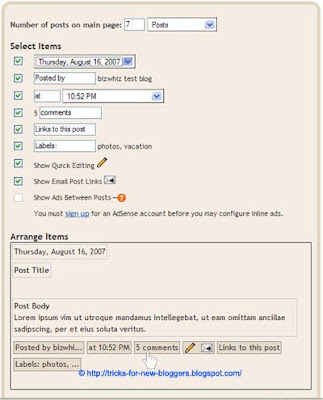 The caution note here is that some blog directories and Ad companies will not accept your Blog unless they can see the date of posts. This is their way of ensuring that you have an active Blog. As you can see, these words can be replaced with other text like “Author” or “Poems by”. The author's name will still be shown. To remove the author's name or change it to an image, you may look up the above guide. The word “at” and the time formats are variables you can change. Not a big deal. If time is not really important to your posts, you may uncheck the box. These are the backlinks showing who link to your posts. Change the text. You can also configure this under Settings -> Comments and choose to show or hide the backlinks. Labels are the tags you have used to describe your posts. For some, other words like “Subjects”, “Genre”, “Topics” or “What About” may be more suitable. Only the blog authors can see this pencil icon when they are logged in to their Blogger account. At a click, they can edit the various posts. Without this function, you would need to go to Posting -> Edit Posts in order to edit any earlier published post. Display this to allow users to email your post to their friends. It is a no-harm-having-it feature, so you may want to leave it there. For those who want to have Google AdSense Ads appear after every post, this is what you have to tick. You will be able to configure the type of Ad size and color scheme. Should you have more than 3 posts shown on a page, Google will display only 3 Ad units (including any Ad in your sidebars) on a page, the current allowable number. To maximize your income opportunity, you may want to complement your Google AdSense with other non-conflicting Ad services like AuctionAds. Also, should you want to place these Ads at the top of the posts or the side, you may follow our tutorial at AdSense Code in Blogger Post Body. Finally, under “Arrange Items” you can adjust and shift the positions of the Post Footer items. Drag and drop them to the desired position. When all is done, Save the Changes and view your Blog to see the new formatted layout of your Blog Posts. Do you know how can I edit a comment? We can't edit other people's comments. If we choose to moderate the comments, we either allow the comments to be posted or not at all. in case if i have big article and in posting it i want just a small part of it to show and to read the rest of the article visitors should click like on "readme.."
do you know how i can do it? I have searched many times and tried lots of things unsucessfully to try and center my blog on the page. Feel free to go see what I mean http://chapmanfamilyadventures.blogspot.com/. It's almost like there's an extra side bar to the right or something... but I don't see it in the html and I've tried reseting everything to classic or minima but my posts are all squished to the left! PLEASE HELP! I don't know where else to turn. Thank you very much!! You don't have to reset anything. The problem is not with the template but your Header image. The template fits the screen nicely but the image exceeds the screen width. Rather than have a template to fit the image, you can resize the Header image to a smaller width and upload it again into the Header. After that, remove the borders around the Header. Hi there, I hope you can help me. The "arrange elements" doesn't work. I wanted the Topics (labels) to be placed on top but when I do arrange them, it doesn't work. Please help. On top of where? You can drag and drop the Labels to another part of the footer. But if you want it below the Post title, look at the article Comments Label below Post Title. Hey guys. Does anyone know if it's possible to drag and drop blog posts within blogger? For example, let's say I had a post from 1 month ago, and I wanted to put that post in-front of the post I made today, would that be possible with Blogger? Thanks for any and all help. P.S. Congrats on your rankings for all your sites. Your sites are awesome. Look at article on Sticky Posts in Blogger to have the previously posted article moved to the home page. I enjoy reading this great blog and colected lot information and also done many changes with my blog as well. But, I want to ask you how can I put some message after each post like you have put "Found this article useful? Mention us in your post, subscribe to our feed, link to us, or bookmark this site. Thanks for your support!" in your blog by editing the html of my blog. I have origionally had two column minima template, but now is three column applying your idea in this blog on my own. I am thinking of putting some codes which converts into link after clicking and also few unclickable words as well. I think you don't manually add this after each post.I really appreaciate your answer. Look at our article on inserting AdSense code after every post. Instead of the code, add your words or message. Hurricane unfortunately never got an answer on his question of Oct 7th 2007. But indeed, why doesn't Bloggers editors feature a 'Continue/Read on' click facility?? It would shorten the Main Page length so much! This is SUCH a useful site you've put together! Thank you! I want my blog posts to appear in reverse order, oldest to newest. I don't see an option to do that. I'm doing a chronology of my hiking trip from initial plan to finish, thus the early stages (oldest posts) need to be first. How to change the photo size in the post???? Those photo i posted, are in medium size. i found photo in other blogger are in posted with original size. I am using the Ms. Moto template and would like to add a small line between blog posts to keep things clearer and easier to read. I've read your border post, but am not sure how to make just a line and not a border. Can you help? Hi.. Friend.. Really nice blog.. I have one doubt. I want to make my blog like this blog.. this is not my blog and am really apologize for posting some one's address. But rather than this i dont have any idea to explain to you. blog he posted the articles. In every articles at the end he said "READ MORE" so that i can read that post seperatly. so I to want to make like this.. Please reply me. hi guys, great work. i wanted to know how to add this "read more" in my post so that only after clicking on this one can read the complete post..
Hi , i have a problem with my template.After i publish a post it didn't show to me "posted by" and "Date [ day month age ]" and neither "filed under"
Please enter on my blog to see what i'm talking about if you don't understand. I have difficulty with the footer elements in the "blog post" widget. It seems that no matter how many times I shift it and resave it, my changes do not appear at all. Even if I try to change the color or font in my blog, it still does not save my changes. Why is it so? Really hope you can help me with this. I've been looking everywhere for a solution but still have not found one that can solve this problem. Hi. How do I align all my post titles? Thanks. also, i would like to know how to get the entire footer to appear under my post title instead of at the bottom of the post. can u help me in this..
not like it used to be before i change my template.. i put these boxes on the right upper side.